I’ve lured you here under false pretenses. Rather than the traditional “FAQ”, I’ve decided to share real questions (anonymous, of course) and my real answers from the past few years. Some of them are similar to each other, but one may be closer to your own than the other. Some may be questions you had not yet thought of and some may not apply to you at all. That said, I’ve created this page in hopes that it helps those who stumble across my blog with unanswered questions on their mind, conscious or otherwise. NOTE: Since this is such a long page, I’ve formatted in page jumps. Click on the section title to jump to that section of questions and click on the questions to jump to my answer. At the end of the questions, there is a link that will take you back to the very top of the page. How long should I spend preparing for the exam? Weeks? Months? My son is applying next year and I was wondering if you know what it is like to apply directly from the U.S.? I am planning to use Khan Academy to help me understand the chemistry, Biology and organic chemistry before taking the exam. When they asked about chemistry, was it like understanding reaction but not actually solving it right? I have not taken any chemistry since high school and I am already in my 2nd year of college so I will try my best to retain all the information in couple of weeks. Was the exam difficult? How long should the motivation letter be and generally what they might want to hear content-wise? How many questions do you need to pass the written entrance exam? I started reading for the entrance exam a few weeks ago, and the exam is in less than 6 weeks! I’m really nervous I won’t be able to learn everything by the time it comes around, but at least I feel confident on the chemistry part of it! Do you think it’s important for me to know every detail about the Photosynthesis and the Cellular Respiration? I haven’t been able to find any decent notes and study guides for prospecting students attempting to study on their own for the exams. I won’t be able to take any prep courses as I live inside the military base until my contract ends in April without any leaves. I was hoping you’d be able to help me out and send as much study material as possible for me to use. In addition, I’ll immensly appreciate it if you could also tell me about your experience with the entrance exams, with getting accepted into Semmelweis, and with the school itself during your studies. How long does the oral examination last? I tend to get really nervous in front of an audience. I’m having my entrance exam for Semmelweis next month. I was wondering if you have any tips for the interview? I get brain freeze when I’m under huge pressure. How long after the entrance exam did it take them to give you the decision? I understand the e-mail came first and then the letter but when did the e-mail come? Do extra-curricular activities and job experiences compliment my application? Could you please help me and give some advice? How much time do I need to prepare myself correctly considering the fact that it’s been years since I studied any chemistry or biology? How hard is it actually? Is it right that it seems a bit too basic or do they also ask deep questions? I’m super nervous and I am curious to know if you had any suggestions or helpful tips when getting in? I am currently taking the pre med program at McDaniel College and I would REALLY appreciate any info you have at all or just even a hello! I started my intensive preparation course in McDaniel college few days ago , I really fell in love with this city and I do really prefer to continue here than any other place, but so far, I’m concernd about getting in Semmelweis because lot of people here told me that its very hard, high requirements and limited spots! I would really appreciate if you can assist me with any instructions about the structure of the entrance exam particularly for Semmelweis and if there any tips or guidance to survive that! Your entrance exam appeared really tough! I’m going to participate in Mc Daniel college for pre-medical classes. I was wondering if you have the name of those books that I’ll need or some PDFs. If you do, could you please name or send them for me? I’m planing to prepare myself before I come to Budapest. I got my acceptance letter a few weeks ago and I was just wondering how the transfer to the second year (and other years) works (I got a bit worried because the letter said I had been accepted into the 1st year of the medicine programme). I know about credits and all but what I do not know is if by passing our exams and obtaining our credits we can pass on to the second year, or if only the best of those accepted into the first year pass. I wanted to ask what exactly are the opening ceremony and the freshmen’s oath? Do we have to put on any formal clothing? What tips would you suggest before starting the course to prepare myself mentally? Is the course very tough? I am going to study with undergraduate students, which means they have some sort of university experience whereas I have just finished A-levels. What can I do to prepare myself for the first semester? Is there anything that you recommend I do in the meantime before the semester starts ? We were told we should buy the books now and she should start reading them other wise she will be behind. Does this sound about right? How hard has it been to learn Hungarian? I want to start studying something before school starts. How did you prepare for it? About anatomy: I feel like memorization and understanding I can do, I just need get into the subject right away.. which is the part I’m nervous about. But the tips you gave me as well as your blog posts about midterms and exams really helps me understand what is important and what kind of questions I should be prepared for, so thank you for that! To be honest, I’m not very familiar with histology and what it is about, so I’m definitely going to get an overview of this subject before I start. But again, your tips are greatly appreciated and will be taken to good use! The booklist you posted three years ago and the 2014-2015 booklist in the Semmelweis calendar differ by a lot (I think they only have one or two in common). Which would I be better off following, do you think? How much do the textbook requirements/recommendations change year-to-year? I can see you didn’t include embryology, histology and biology. Are books for these subjects not neccesary right away, or how does that work? I was hoping you could answer a few questions I have about the electives. I’ve heard that many people don’t take electives the first semester, yet in the big calender book it says that 4 credit points from obligatory electives/electives must be collected in each semester..? I’m going to be visiting Budapest in a couple of weeks to see how I like the city. Do you recommend any Hotel for us to stay in as a family? And what sights are a must see while we are there? I actually wonder if you worried about the same things I do in terms of attaining a medical education, being from the US (whereas I’m Canadian). What’s it like living in Budapest? How is the food? Do many people speak English (Do some of the appliances still in use really say made in the USSR!? – that’s hilarious, I want at least one)? Are the locals friendly? Are classes clustered together in close-by buildings relative to the campus? How comprehensive are the English lectures? Is it usual or unusual for international students to go directly from high school in the medical program? How is the quality of the teaching/practice and English of the teachers? Where are most of the lessons held in the first year? Is the quality of buildings/rooms ok? Do you have a nice international student community and life? I was wondering if you knew how people get along in them? Is it renowned for being very difficult? Do they want you to fail? Do many people resit? As I’m in my final year of school, trying to apply for Semmelweis, I have encountered soo many naysayers who said that the school wasn’t that good and that you didn’t have enough clinical experience etc. To be honest, I have to travel out of my current country in order to write the entrance exams and that costs a lot… I want to ask if I should really take this step or not? I’d heard many times that universities in Hungary are not very good, that professors do not really care about teaching or the students, and that in oral exams, they fail you on purpose for a year or two so that they can get extra money. I don’t know to what extent this is true, however, I want to ask what your opinions on this are. Have you ever experienced something like this? I’ve come across many posts that suggest people should stay away from Hungarian universities as they aren’t very good and there is corruption every where and the only way to pass exam or get good clinical experience is to bribe the professors. I wondered if you are able to provide any comments regarding this aspect. Also, are the exams conducted orally only and there is no written exam during the Medicine programme? Again, people are suggesting that as the exams are oral they are open to abuse and the professors can fail you if they don’t like you or you make a single mistake then you end up repeating the whole year. Is this an accurate reflection? I’d like to know a little more about the oral exams if I may; when these are undertaken, is it a 1-2-1 environment behind closed door or are there any impartial invigilators involved in the process at all? If it is just the student and the Professor then I can see this being very subjective where the student thinks they have done well whereas the Professor may think the opposite – so to me it would make sense to have someone else in the room as well. What are your experiences/thoughts? I’m interested to know the level of pastoral support that is provided to international students by the university and the lecturers in particular – what are your experiences and how approachable are the lecturers as SE? Whilst I can understand that there is a need to learn Hungarian, I also note and fail to see why there is a requirement to study Latin – is there a specific reason for this or is this just a timetable filler subject? Whilst the education is recognised in the EU, is it possible to do your 6th year internship away from Hungary at all? Do you know of anyone who has successfully done this? What I really want to know is: what is it really like? Once you remove the glamour of living alone and going to medical school and the freedom from your parents, then what is it like? Did you find it tough to get into Semmelweis, is it really that hard? Could you please provide me with some honest and personal insight. Not knowing anything about the language and culture there do you recommend studying in Semmelweis University? What do you like best about life in Budapest? What do you dislike? I’d appreciate an answer as I don’t have much time to decide if I’m going to Budapest to study or to Norwich in England. I’d be living completely alone as a 17 year old in both places so definitely a new experience for me. How is it for you in Budapest after these years? Does it ever change? I mean, I don’t feel home here, it’s just a place I like and live there but it’s different. How much time did you have to dedicate to studying everyday? Any tips for studying? How do you cope with procrastination? I plan on starting a blog one day… I’ll let you know when that happens! How do you time it in? You must be uuuber organised!! I also wanted to ask you what your study method is? I’ve read the posts you’ve written on your blog, but I didn’t quite understand them. How did you for example study for Anatomy and Histology? I think your notes are amazing and I really want to get on top of things as quickly as possible. I’d rather not spend too much (VALUABLE) time figuring out how to study.. although I know that not everyone can study the same way in terms of preference. Hello. I was wondering what brand of notebooks you write your notes in. I’m kind of picky about the ones I use and yours look awesome! How much does it cost to live in Budapest? How much did you budget for rent, utilities and food? Did you use the service for finding a place that is on the school web site. When you say furnished, did you still need to buy plates, pot & pans ect, or is it complete move in? Did you end up finding your apartment online? I read from your posts that your boyfriend (I think he is your boyfriend, sorry if not) went to Budapest in advance to go apartment hunting. I’ve never been to Budapest before so this seems like an immense task. Is there anything I should look out for when renting the apartment? I was thinking of one in District 9 as its very close to the Uni, do u recommend that? If you don’t mind me asking, how do you pay for school? Do you do the summer practice in Budapest or can they be done in different countries each year? Just wondering, do you have time off during summers, or do you have to do a residency? I have some questions about the summer practice in nursing; I see that the uni has listed some institutions that are approved in Norway, where Im from. Do you know if its possible to do the summer practice in another institution? Since none of them are near my someplace.. If its possible to do the practice in another place than the listed ones, how do I proceed with getting this approved by the uni? I’ve recently started thinking about studying medicine in Hungary, and I heard from various sources that Semmelweis university is one of the best medical universities there are. The problem is…I’m in my second year of medical school right now, and I have no idea if they accept transfer students, and do you have any idea about the rules and regulations that the university has regarding transfer from a university outside Hungary (and…ahem, the EU for that matter)? I’ve asked around for some feedback about the entrance exam. I feel it gives a better idea of what to prepare for. Student 1: I didn’t really have much to do because I already had a degree and was pretty much just accepted after sending in my application. Student 2: I did it straight out of high school. You either go to California or New York (I don’t know if there are more places) and take an exam with a representative. I have the emails for both if you want me to send them! You email and they tell you what exam dates they have then you schedule it with them. It was 20 questions chem, 20 bio! I took the test, then she graded it and after started going over it with me and then she advised the pre-med year! I can’t really remember what was on the tests but it wasn’t bad and was pretty short. Student 3: My experience was similar to my cousin’s (student 2). I had done a freshman year of college by then, so I had basic bio and chem done and I somehow passed, so I think it’s okay. I’m pretty sure my cousin didn’t really focus on science in high school, which is probably why she was advised premed. Student 4: I went to Chicago and met with Dr. Hass, he goes back and forth between there and upstate New York. Really strange interview about all sorts of general knowledge things as well as more expected basic biology and chemistry. I got asked about a few famous Hungarian scientists, how the treaty of Versailles affected Hungary, what I think will happen in the next season of game of thrones, as well as a lot of random questions about things in my entrance letter. Because I mentioned I spoke Spanish, I had to speak it with him briefly. Was really all over the place, but as long as you keep calm its not a big deal. You don’t have to know everything, I didn’t know several things he asked and it wasn’t a big deal. Student 5: Mine was soooo different from other countries, but at the same time I don’t know if anyone had the same experience as I did in LA. I was the only person there that day (which may be a reason mine was different) and in all it was like 4-5 hours. But the lady basically talked to me for a while, had me do the tests, graded them, and then she literally went over each question and answer with me and changed some of my wrong answers to give me better scores. no joke. and I didn’t really have an oral exam part since she would kinda gauge my knowledge while talking thru each question from the written exams. I am planning to use Khan Academy to help me understand the chemistry, biology and organic chemistry before taking the exam. When they asked about chemistry, was it like understanding reaction but not actually solving it? I have not taken any chemistry since high school and I am already in my 2nd year of college so I will try my best to retain all the information in couple of weeks. Was the exam difficult? I hadn’t taken chemistry for a few years before the entrance exam, so I totally understand! I felt that I was prepared enough with the Khan Academy videos. When they asked questions during the interview, it wasn’t too bad. In the first one I was asked to say what a polysaccharide is and then in the second I was asked to draw glucose and I think describe osmosis or something like that. There was no solving of reactions or anything too deep into chemistry. Intro: I am writing to request admission into the English language medical program offered at Semmelweis University. (Then one quick summary sentence about why). A short summary of my resume (education, achievements). About 5 sentences. Paragraph about myself, how I am as a person, why I want to become a doctor. About 5-8 sentences. Why I believe that Semmelweis can help me achieve my goals. About 4-5 sentences. For the entrance exam, I don’t know if there is a set limit of points you need to have. I think that they look at your application as a whole. Depending on where you apply from, there is also an oral exam/interview. I got 14 on my chemistry and biology sections and I remember him saying that I had done “ok”. That’s a good amount of time! Don’t stress too much about it – I know it is easier said than done. If I’ve learned anything in med school it is that looking at all the things I need to learn at once won’t do anything but drive me crazy. Take it one day at a time. A LOT will be learned over those 6 weeks! I don’t remember there being any questions about photosynthesis to be honest. There may be some in the multiple choice questions, but they really do keep it medically based/relevant. Cellular respiration and Kreb’s cycle, etc. are important, but those are also things that will be covered in biochemistry during second semester. You won’t need to go into the details about the enzymes and reactions involved, but should know generally how the glucose is broken down and how much ATP is generated and where. I wasn’t able to take any prep courses either. On top of that, I had very little time before the entrance exam and had been out of school for a while. I prepared by watching all the Khan Academy videos I could and making my own notes from the videos and then reviewing those before the exam. I also scanned through some summary guides I got from my counselor (the one who handled my application). The Khan Academy videos have really improved and expanded since I took it in 2012. They even have a Medicine section now (rather than just biology and chemistry). I really, really recommend it. https://buda-b.com/for-med-students-helpful-websites/ – here you can find some links I found useful and also links to those summary guides I mentioned earlier. There are so many things to say about the general experience here that I don’t really know where to start or what to say. I will tell you that it is really tough, especially in the first two years, and that you need to have a lot of self-discipline to push through it. Most of the people who struggle are those who aren’t really serious and aren’t motivated enough. There is a big culture difference and that has to be respected and you can’t let it get to you. I’m the kind of person that likes working against pressure. I like proving people wrong and proving myself against tough examiners. They demand a lot from us, but I really believe that that makes us better. I’m very, very secure in the education I am receiving here. They go so deeply into some topics sometimes that it might drive you crazy, but it all comes together in the end. Hope this is coming across clearly! I’m just writing as the thoughts come to me. In short, I’m very happy with my decision to study here, I feel I’ve gained immense life experience in addition to a great education, and it has been a very tough battle to get through it all. The oral exam length varies. They want you to feel comfortable and want to really get a feel for your knowledge. Everyone gets nervous :p and oral exams are no exception! Just take a deep breath and treat it like a conversation. Try to sit confidently and with open body language and don’t be afraid to ask questions if you have misunderstood something. That will make you appear confident – even if you’re dying inside! I have some of the same problems when I’m in an exam. I have a hard time working on new concepts and usually end up repeating things I’ve memorized – so I totally understand! The best thing I can recommend is to practice explaining concepts to other people or explaining them out loud to yourself. Try presenting topics on a whiteboard or piece of paper. Thinking about things in that way and verbalizing them is a really great way of getting comfortable with the topic. Keep your mind clear of negative thoughts, take a few deep breaths if you need it. I used to keep a few motivating quotes in my mind to help me stay calm. Stay strong if they begin to ask difficult questions or say things that test you. It is as much a presentation of yourself as it is a presentation of your knowledge. This is my favorite motivational video: https://www.youtube.com/watch?v=c-KVpZmHbac. I used to watch it on repeat for every exam and think I have listened to it almost 1,000 times now. It is not the critic who counts; not the man who points out how the strong man stumbles, or where the doer of deeds could have done them better. The credit belongs to the man who is actually in the arena, whose face is marred by dust and sweat and blood; who strives valiantly; who errs, who comes short again and again, because there is no effort without error and shortcoming; but who does actually strive to do the deeds; who knows great enthusiasms, the great devotions; who spends himself in a worthy cause; who at the best knows in the end the triumph of high achievement, and who at the worst, if he fails, at least fails while daring greatly, so that his place shall never be with those cold and timid souls who neither know victory nor defeat. – Theodor Roosevelt, 1910. Just trust yourself and your knowledge 🙂 Keep motivated by the fact that it doesn’t matter what the result is. In the end, you’ll end up where you want to be, no matter what path you took to get there. It took a while for the letter to get to me (my exam was June 5th, they sent the letter June 8th, and I received it on June 20th). I was told that they would send the results via email, but was then told that they actually don’t do that. I’m sure any “resume boosters” will help. I’m not exactly sure of how their admission process is…it doesn’t seem to be as specific as it is in the US at least. Our class is such an eclectic group of people from all over the world with all different kinds of backgrounds. Your having some medically related experience will surely be a big plus. In my opinion, it is not that hard to be accepted as long as you perform well enough on the entrance exam. Skjalg had never even taken a biology class before and he got accepted on the first shot. As for me, I got in on my second attempt. I hadn’t been in school for a couple years at that point and just spent a couple weeks watching videos on Khan Academy and reading in a biology book. That was enough to get me in. One thing I’ve come to learn is (and putting it bluntly): it’s easier to get in than it is to stay in. I think we were about 300 when we started and we are down to about 170 now. It’s not impossible, it is just a lot of hard work and a lot of people aren’t ready to make that commitment. There are no set odds that I know of…I’m not sure how many people even apply. I think that the examples that can be found online are much easier than the actual exam itself. They do ask some basic questions, but may also ask some more detailed questions – even going into organic chemistry. There are two parts to the exam: first a written and then an oral exam, which is called the interview. In the interview, they can ask you whatever questions they like and may expect you to go into detail. In regards to how long you will need to prepare, it really varies from person to person. Some people take a year and some people only a couple of weeks. It depends on how quickly you recall what you learned when you took biology and chemistry and how quickly you can review the information. On my blog in the resources galore section, you can find some pdfs given out by Masaryk University. These are sort of summary/review books for what material you should know for the exam and might give you an idea of where you are in your knowledge. When I prepared, I used Khan Academy and found it extremely helpful. I learn well from videos and it helped me to stay focused and motivated while studying. All of my friends who did the pre-med course said that it was no problem getting in. My best friend Jannie said that she felt like she was already in and that they just wanted to check that she was “normal” and had some knowledge. She said that they usually ask, “What is your favorite topic?”, so she recommends preparing a little for a topic of your choice. She said cardiovascular system and was asked some basic questions about the heart (like names of the chambers, etc). She also recommends going through the sample tests that you get from the school over and over again. They will also ask you some questions about yourself (where you are from, why you want to study here, what your hobbies are, etc). It might be good to have an idea of what you would like to answer to those types of questions. You are in a really good position in that you are studying premed. They are really good at preparing you for the entrance exam. As long as you make sure you study well, you shouldn’t have a problem. I have many friends who did premed and they said it was a huge, huge benefit. There are always going to be a lot of rumors going around. Try not to listen to them too much! They never stop either – there’s tons here in 4th year too! I think the structure varies depending on where you apply from. If you are going to take it here in Budapest, I recommend talking to one of your teachers and asking them. I took it in Norway and we had a written exam in chemistry, biology and English followed by an interview where we were asked various questions. The interview varies a lot, so it is hard to prepare for this. Just do the best to prepare yourself and try to be as confident as possible on the day of your exam. I really, really liked the Khan Academy videos. I used pretty much only those when preparing for my entrance exam. I watched almost all the ones they had and made my own notes. Plus I review some summary notes I got from my counselor. You can find them in my blog under the “resources galore” page. You will also get a lot of things when you start. I totally understand wanting to start a little early (I’m the same!) but it can be hard when you don’t know exactly what they want you to study and how they want you to study. I didn’t take pre-med, so I unfortunately don’t have any tips. I can say though that I found Khan Academy videos really, really helpful when preparing for the entrance exam – maybe those can help you too! Each year, we have classes that serve as a prerequisite for classes of the following year, so if you do not pass that class, you cannot continue onto the next year. It is common that people need to do a class over again and are therefore unable to completely move onto the next year. It is not true that they only take the best students – as long as you pass your exams, you are fine! You will have 3 opportunities to take each exam (there is a 4th try if you need it but you must get permission from the dean of the university). I have only ever failed two exams and have passed it on the second try. My boyfriend is the same, except there was one exam where he needed to take it 3 times before passing. You are not the only one who will be coming straight from finishing A-levels, there are quite a few students that begin around that time – just so you don’t feel alone! I know it can be really overwhelming and I’m not sure I can say exactly what you need to hear to prepare you. My best advice is to just keep pushing forward, even when it feels impossible. To study consistently, work hard and evolve your study style (you’ll see that you need to change this a lot). Don’t let yourself be discouraged by the challenges, just take them as a learning opportunity and move on. The first two years are very hard. Sometimes it will feel like everything is against you. I just kept reminding myself of how bad I want this. People can get really negative when the stress gets too strong – don’t let yourself get caught up in that! Just keep as positive as you can, work hard, ask questions, ask for help. I promise you, it gets much better with time. When you start 3rd year, the teachers treat you differently. They will look to you as a colleague and treat you with the respect of an equal. 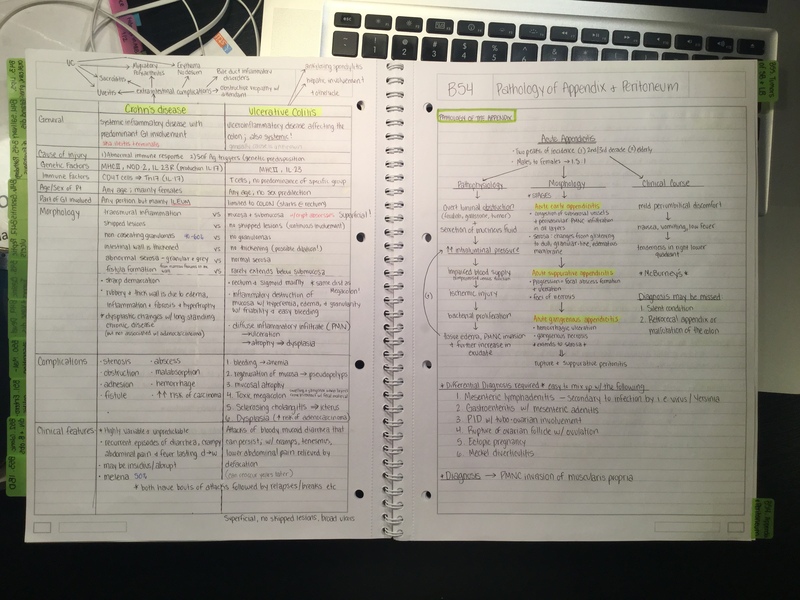 It is all worth it – trust me!When it comes to priming your brain for the upcoming semester, I recommend getting comfortable with some anatomy language. Maybe find an anatomy youtube channel and watch some videos. Get used to the terms used to describe anatomical parts. Anatomy is the big subject of the first year (though biophysics and chemistry/biochemistry are big players as well). Don’t go too crazy with studying, since you don’t exactly know what to study yet. I’ve always been one of those people who starts studying before the beginning of the semester – and I always regret it! Sometimes it pays off, but only when I know what I am doing. I remember spending a week studying for physiology before second year, and we covered what I had read within the first half of the first lecture (so, that week was pretty much a waste of time). You’re going to be so unbelievably busy once the semester starts that I recommend relaxing as much as possible and enjoying your free time. If you really, really want to start, I would recommend getting the anatomy vocabulary down. Most of the anatomy books have an intro chapter and they are great for getting your feet wet. During the first two years, I started studying before the semester began and I always felt like it was a bit of a waste of time. Not because I didn’t learn anything, but the material I spent a week covering on my own was usually covered in just the first day. I think it is good to brush up on some basics and maybe learn some basic anatomy terms, but other than that, I think it is better to wait. Once she has started, she’ll see just what needs to be covered. Hungarian is probably one of the most difficult languages I know. That said, we’ve learned enough that we are able to communicate with the patients in the hospital in Hungarian (some more than others). I was really nervous about learning it before moving here but it all ended up working out. We have Hungarian for 5 semesters and are expected to communicate with patients in Hungarian during Internal Medicine practices during 3rd year and on. I was just like you in wanting to get started with my studies before the start of the semester. I actually did this for the first three semesters and discovered a couple things. First, it is easy to waste time (though I do believe no time spent studying is time spent in vain) because you don’t yet know what is expected of you, which topics to spend however much time on or which points are really emphasized. Things move so much faster once classes are in session! For example, I spent a week study for physiology before the beginning of second year. The material I’d studied on my own ended up being covered in just the first HALF of the first lecture. Granted, I was off to a good start and adept with this specific material, but it really wasn’t the most effective use of my time. Now, rather than go full study mode, I sort of leisurely read through the books of the various subjects and get a feel for the vocabulary and topics. Second, during the semester and during exam period you are going to wish that you spent that time doing something else. I learned this the hard way! The curriculum is very heavy and requires that you stay on top of it during the semester – and exam period is a whole different level of demanding. Some people are able to pull off a vivid social life and still get through, but most discover that consistent hard work and dedication are key. When you HAVE TO study, you’re going to wish you had done anything but when you had the free time. After 6 semesters, I’ve found a healthy balance. I do a little bit when I really feel like it. After all, medicine is our passion! That said, I’m not going to go crazy. I’m happy with just priming my brain for the semester! About anatomy: I feel like memorization and understanding I can do, I just need get into the subject right away.. which is the part I’m nervous about. But the tips you gave me as well as your blog posts about midterms and exams really helps me understand what is important and what kind of questions I should be prepared for, so thank you for that! To be honest, I’m not very familiar with histology and what it is about, so I’m definitely going to get an overview of this subject before I start. But again, your tips are greatly appreciated and will be taken to good use! One thing I’ve noticed is that my brain feels like it switches into a totally different mode when school starts. When I start studying before the semester, everything feels so slow and confusing and then once I’m in class, it turns into a super-charged sponge! I’m sure you’ll experience will be the same thing. Just make sure to keep moving – keep studying during the semester, keep up with your classes, etc. A lot of people leave it all to the end and really, really struggle as a result. I didn’t even know what histology was before school started! It’s just looking at anatomy at the microscopic level to see how the tissues/organs are built up, what types of cells, etc. Check out “shotgun histology” on youtube for an idea. Anatomy – the big class of first year. For this, you should really look through the different atlases and choose the one you like the most. You’ll need an atlas and a textbook. The thieme pocket books are great – I highly recommend those (in addition to atlas and textbook; easy to bring with you to dissection). For a text book, I liked Moore’s Clinically Oriented. I think I have it on pdf if you want to save money and don’t mind reading it on the computer/tablet. As for atlases, Netter‘s is ok, I’m not the biggest fan of the drawings; Sobotta, I love, beautiful drawings; my ultimate favorite: the big Thieme books, we didn’t use these until preparing for the final and they are my absolute favorite (gorgeous drawings and included some text). There is also a picture atlas called Color Atlas of Anatomy (Rohen/Yokochi – everyone just calls it Yokochi) that I really recommend because it has real pictures and is extremely helpful in preparing for dissection/exams. Physics: the department has it’s own book that you can buy from other students or in the Medicina book shop. I recommend this one because it follows the topic list and includes the details they want. A lot of people didn’t use this, but I found it really useful. Chemistry: we bought books for this and never even opening them. There are little department issued books covering some theory that are available for purchase at the school. Here, I recommend lecture slides and internet resources. In second semester, you’ll have biochem and for that they have changed the official book to Harper’s. Communication: there is a book by the department that you can buy at Medicina. Some people don’t use it, but I recommend it. It’s short and can be covered in a day or two (i.e. during exam period) and covers exactly what they want to hear. Hungarian: book published by school, you’ll be told where you can buy it during the first week. Haha, I didn’t even notice that – good catch! For biology, most people used The Cell. We had a different one that we used, I think it was Solomon, but I honestly think we looked up most of the stuff up online. We ended up using The Cell later on though, I think during biochemistry, so it is a good investment. For histology, I really liked the Ross Histology and Cell Biology book. It has wayyy more detail than we need to know, but I still liked it best. Otherwise, most people used Junquiera. For embryology, I used Langman’s and really liked it for some chapters (like development of the nervous system and internal organs) but didn’t feel like it was the best in the very beginning. The most popular one for embryo was Moore. There is a book sale at the Freshman day on Friday the 4th where older students sell their used books. I recommend making a list of the ones you want to get and getting them there. So many freshmen don’t know what they want or what to get on that day and miss out on a lot of good deals because of it. Also, do I have to take all the obligatory electives by the end of the fourth semester? If not, which ones do you recommend? I already signed up for the elective “basics of medical chemistry” seeing as it gives 3 credits. I’ve heard that you don’t really have time for electives the second year because of the heavy work load.. This is really confusing and even more so with the lack of information the school has given us. Hope you can help! I didn’t take any electives during the first semester of first year or during all of second year. The way I understand it, all that matters is that you have 30 credits per semester, but it doesn’t matter how you do this, i.e. I should have 180 credits by now (30 credits x 6 semesters). I have 174, but this semester I will be taking 35 so I will only be one short at the end of this semester. I remember being frustrated with the term “obligatory elective” because they are classes you have to take…and therefore not elective. As for what to do, I’m going to send you a crazy long list that I sent to a friend who will be visiting Budapest. It’s a bit long…hopefully not too overwhelming. It has most of my favorite parts of Budapest. Something that’s not on the the list that you should try is an escape room! They are tons of fun!! 1. Climb up the stairs to the top of the Basilica. Gives you a gorgeous view of the city! 3. Enjoy your coffee while you walk towards Parliament. This is one of the most beautiful buildings I’ve ever seen. I haven’t taken a tour inside yet, but my friend Amir says that it is an absolute must! 5. 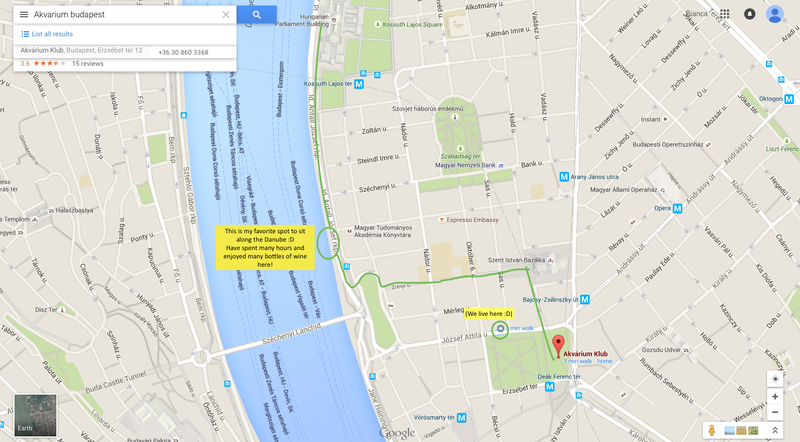 Take your goodies and head either towards the banks of the Danube or if you’re up for a bit of a longer walk, towards Margit island. Then just pick a perfect spot and picnic the day away! 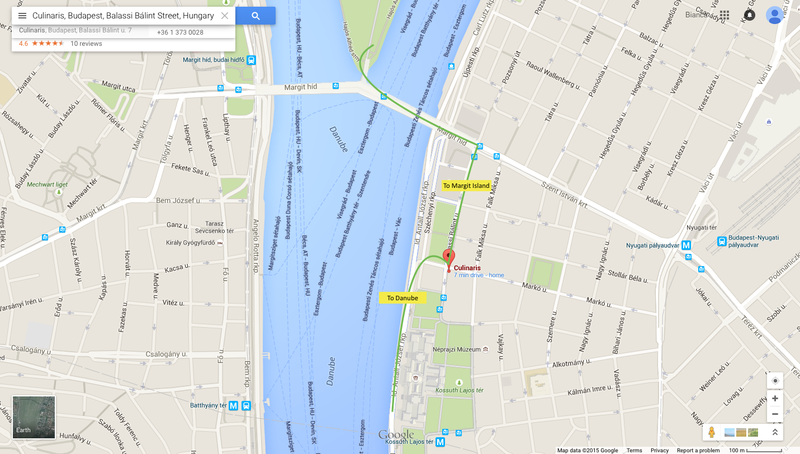 You should also explore Andrassy ave (tons of shopping) and maybe walk down towards Heroes square. If it’s a warm day, you should definitely check out Széchenyi Bathshttp://www.szechenyibath.hu) or Palatinus Strand on Margit Island (http://www.tripadvisor.com/Restaurant_Review-g274887-d4005838-Reviews-The_Bigfish_Seafood_Bistro-Budapest_Central_Hungary.html). And check out the spas! Budapest is the Spa Capital of the World! For more active stuff, you should hike up to the top of Gellert Hill – gorgeous views over the city! You should also head up to the Buda castle! From there, you can walk North and pass through a small town with cobblestone streets – really charming! When we first started here, a lot of the students in first year experienced a bit of a culture shock. We are a really mixed group of people, all ages, all backgrounds, all cultures. We range from 18 year-old Irish girl fresh out of high school to 35 year-old Indian with a PhD in Biophysics. That said, the experiences people have vary quite a bit. For me, it was easier to adjust to living here because I had already had quite a culture shock when I moved to Norway from LA (I moved there in 2009). I think the key is to accept that things are going to be much different than they are back home and just go with the flow. It is an amazing experience to live for an extended amount of time in a completely foreign country and you miss out on that experience if you are constantly comparing it to how things are at home. I really, really love living here. It is such an absolutely beautiful city and student life here is fantastic. There are hundreds of great restaurants and things to do. The city is full of life in the summer – which is so hot and amazing. I feel really lucky to study here and am really going to miss it when we leave. So in the meantime, I’m just trying to enjoy this chapter of our lives here. The food is amazing! I’ve been really impressed with the restaurants here. Fresh seafood is lacking since it is a landlocked country, but there are still some great seafood places here. The grocery stores are usually small, there are some big ones around the city but it depends on where you live. We order our groceries from Tesco through their website and get home delivery. It only cost 1.5 euro, so it’s really cheap. There are also large markets where you can buy fresh fruits, veggies and meats directly from the farmers. There are also some specialty shops where you can get various imported goodies from the states and England. Generally, the Hungarian people have quite poor English. In areas where there are tourists, they are usually very good, but in a lot of the grocery stores they may not understand anything you say. It was a little weird in the beginning, but I have gotten really used to it. There hasn’t really been a situation where I haven’t been able to communicate at all. There are so many International students here, so English is becoming more and more common. In terms of the teachers at school, it can vary quite a bit. You eventually get used to the accent and then it won’t bother you so much. I’ve learned to become very patient and am quick to figure out what someone is saying while they are trying to explain it. You will take 2.5 years of Hungarian and will have to speak with the patients in Hungarian as well. It is a really difficult language to learn, but it pays off to put some time into learning it. I haven’t seen any appliances that say made in USSR 😛 Maybe in some older apartments? Most of the apartments the international students live in have been renovated, so I’m sure they’ve been switched out. Despite the lack of English skills, the locals can be friendly – if you try to speak Hungarian. That said, customer service in Hungary can be a hit or a miss. It is night and day when you compare it to the US. I usually warn visitors that they can come off cold or rude. Again, it really varies, depending on where you are. The women at the grocery store on our corner can be really grumpy somtimes and really nice others, and then at the coffee shop down the street, they give us a discount every time we go there. For the first year, most of the classes are in the same building (or really in two buildings that are a couple mins away from each other). From third year, you’ll be in different buildings. When you start in the clinics, you’ll have to travel to the different departments, which are spread all over the city. As I mentioned earlier the English levels of the teachers can vary. Some of the lectures are amazing and some are really hard to follow. You really do get used to the style of speaking though and I honestly haven’t felt held back by it in any way. Hopefully I was able to answer your questions. I know it is a scary though to completely uproot your life and move to a new country. But I’ve done it twice now and I can honestly say that it is the best thing one can do. I’ve learned so much about myself through these experiences and the challenges that I have faced make me feel like I can handle anything that is thrown my way. It opens your eyes to the rest of the world and you feel connected to people and countries that you would have never otherwise felt connected to. I have friends from Sweden, Nigeria, Japan, Israel, Spain, Portugal, India, Finland, Canada and the US – it doesn’t get more exciting than that! How did feel about adjusting to the exam system at Semmelweis as compared to the exam system in the U.S? Did you have trouble with the written or oral exams at Semmelweis? For me it was a pretty big transition to go from written to oral exams. One thing I’ve learned is that even though we don’t have oral exams in the states, we do quite while. This is due to a combination of our level of English and ability to present. I felt really, really nervous in the beginning – and I honestly still do – but I have always had decent to great experiences during oral exams. 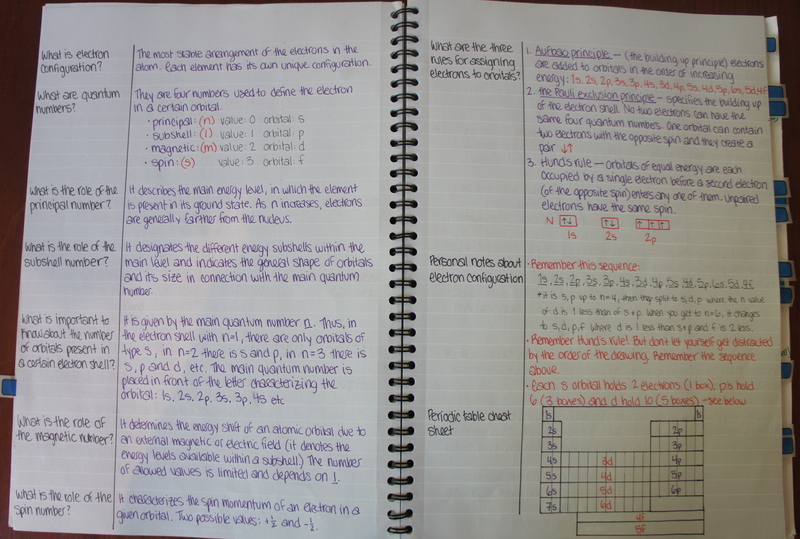 The exam system is very, very different. You have several “midterms” a semester, whether or not they need to be passed depends on the subject. Some are oral and some are written. For the semi-finals and finals, you have 3 opportunities to pass as exam. That may seem strange, but trust me, people use them! I’ve only ever had to retake 2 exams, but there are many that need the multiple chances. I thought it was unusual (coming from the states where you have to first have a bachelor’s degree and then take the MCAT) but it is actually quite common. I would say that the average age for first year students is around 21/22, but it’s hard to say for sure. In my group we were something like three 18 year olds, four 22 year olds, two 23 year olds and three 25 year olds – but we were one of the “older” groups. Since medical school here is 6 years and doesn’t require a previous degree, many students either come directly after high school, or take a year off to work before they come. This really varies from teacher to teacher, but I haven’t had a problem with it – at least once I got used to their way of speaking! Sometimes exam questions may be worded a little strangely in exams or you may need to ask them to repeat themselves, but generally I find it to be quite satisfactory. I have noticed that I do have to be careful with how quickly I speak because they sometimes have a hard time following, but I’m also a very fast talker! I would say that 20% of the lectures are great English, 70% are good/sufficient and maybe 5-10% are more difficult to understand. During the first year you will be at the main building (EOK) and the anatomy building (1 min walk away from each other). You will have a Hungarian language class and some groups used to have theirs in a building across the city, but this will depend on your group/teacher. Yes, very. The main building is either new or was recently renovated. The anatomy building is older, I think over a 100 years, but they have newly remodeled dissection rooms and have modern equipment (i.e. giant interactive projector screens in the histology rooms). The NET building is where you will have most of your classes from 3rd year and that one is a bit older, but the lab rooms are very fresh/modern. Extremely! There are people from all over the world here, something that I appreciate immensely. I have close friends from Japan, Sweden, Israel, Norway, Canada, Spain, and the US. When you start first year you are assigned to a group based on your last name and you stay in this group for the first two years. This gives you a chance to really get to know those people in the group with you. Then from third year, you’re able to choose your own classes and you’ll meet a whole bunch of new people as a result. It is such a unique and rewarding experience!! When it comes to other schools, I really don’t have any firsthand knowledge of how Semmelweis compares. I’ve heard a lot of things though, from friends who have close friends studying in other universities in Europe. I did talk to one Erasmus student from Germany who said that they are much more strict here and seem much angrier when you don’t know an answer or get an answer wrong. From this information, my impression is that they demand a lot from us and that it is much harder in the earlier years than other schools. I don’t really know what to say other than: yes, it is really hard, but also possible. It is EXTREMELY common to have to retake exams. I’ve had to retake two, which is on the rare side! Some people are probably up to 20 (from all 4 years) at this point. I’ve never experienced nor have I witnessed an unfair exam. I’ve heard plenty of stories, but I’m always a little hesitant to believe all the details from just one side. I’ve been through probably 50 oral exams at this point and I can say that each one has been fair and just, sometimes they’ve even been too kind (though that might just be me being to hard on myself). If you know the basics, they won’t fail you. If you miss a crucial point, they might fail you right away or give you a couple more shots. There was a girl in my internal medicine exam last semester that couldn’t explain the difference between type 1 and type 2 diabetes and she STILL got a chance to keep going for a few more questions before they failed her. As I’m in my final year of school, trying to apply for Semmelweis, I have encountered soo many naysayers who said that the school wasn’t that good and that you didn’t have enough clinical experience etc. To be honest, I have to travel out of my current country in order to write the entrance exams and that costs a lot… I want to ask if I should really take this step or not? There are always going to be naysayers and there are plenty of them to go around! It really makes me sad that there are so many negative comments – not just here, but in life in general. I will tell you that it is really tough, especially in the first two years, and that you need to have a lot of self-discipline to push through it. Most of the people who struggle are those who aren’t really serious and aren’t motivated enough. There is a big culture difference and that has to be respected and you can’t let it get to you. I’m the kind of person that likes working against pressure. I like proving people wrong and proving myself against tough examiners. They demand a lot from us, but I really believe that that makes us better. I’m very, very secure in the education I am receiving here. They go so deeply into some topics sometimes that it might drive you crazy, but it all comes together in the end. Hope this is coming across clearly! I’m just writing as the thoughts come to me. In short, I’m very happy with my decision to study here, I feel I’ve gained immense life experience in addition to a great education, and it has been a very tough battle to get through it all. As for the clinical experience, we have classes in the hospitals every week (from 3rd year) and you can get a lot out of them if you push for it. A lot of teachers will let you come and join them for shifts and are really happy about it if you do. I want to be a surgeon so I spent a lot of extra days outside of class in the operating room. We even got to assist on some surgeries. But this is because we asked and pushed for it. The opportunities are there if you want to take them. On top of that, we do summer practices in nursing, internal medicine and surgery. If you find a good hospital to do this in and are dedicated, this can be an amazing experience. Doctors want to teach you, but only if they see that you want to learn. I know it’s really expensive to travel out of your country to take the exam and it’s probably a big step to take. But, if you like the school and you want to apply, I really think you should go for it. You know better than anyone what the right choice is. I’ve had plenty of people tell me I’m going to fail in my life and I’m so happy I never listened to them. So I always think that you should ignore the naysayers and go for what you know is best for yourself. See, recently I had been accepted to attend the University of Szeged Prep Course, and although it is not in Budapest, I thought maybe your comments would help. I’d heard many times that universities in Hungary are not very good, that professors do not really care about teaching or the students, and that in oral exams, they fail you on purpose for a year or two so that they can get extra money. I don’t know to what extent this is true, however, I want to ask what your opinions on this are. Have you ever experienced something like this? I would very much appreciate if you could give me some info as I’m pretty much lost on this. I don’t know too much about Szeged, but I have definitely heard those types of rumors before. When it comes to my education at Semmelweis, I am very confident. I genuinely feel like we are getting an amazing education here, one that will prove itself when we enter the “real world”. I think we see it the most when we talk to people who attend medical schools in other countries, mainly Norway and Sweden, and compare the curricula. The curriculum here is very difficult and there is a lot of pressure put on the students. I have had some teachers who didn’t seem to care so much and others who cared too much – but I think that it true of almost any school. Generally though, my experiences have been very good. I heard most of the rumors during my first year and didn’t understand where they were coming from. It honestly seems like they are just passed down from people already attending the university. To be honest, I never liked these rumors. I don’t like to think that there is something working against me such that I can fail no matter how hard I work. I chose not to listen to the rumors and continued on in my own way. The only stories I wanted to tell were those I had witnessed myself. And nothing ever happened! I feel that all of my exams have been fair, very fair, and when it comes to the exams of others, I have never witnessed any mistreatment. In the end, we’re going into a profession that requires daily decisions about people’s lives and health – so it should be hard. I feel like a lot of people here think that just because they got in, that they should get an automatic ride through. I’ve noticed that whenever things get hard and people start to fail, the first thing they do is blame the school, rather than thinking that maybe they should have studied differently or studied a little more. Sorry for making my answer so long! In short, my opinion is that I believe we are getting a great education here and it is very difficult and that makes people complain a lot. I hope that was able to answer your question. It makes me sad to hear that the information you have been able to find about the school is so negative. This is not the first email I have gotten asking me to address this personally. I’ve heard these rumors too and it disappoints me that the bad comments travel so much further, last so much longer, and hold so much more weight than the positive ones. I don’t want to give any more life to these rumors than they have been given already, so will rather tell you about my own impression/experiences and some of those closest to me (about things that happened to them specifically). Personally, I have never, not once, received a negative comment, been verbally abused or chastised in any way during an exam. One of my close friends told me recently that this is because I am “a good student and when they know that, they treat you differently”. I have no way of knowing how I am perceived by the teachers, or what their thoughts are about me, so I can only say that I have only ever had good exams. Anytime I’ve been in a situation where I said something wrong or couldn’t answer a question, the examiner has either tried to help me figure it out or moved on. In spite of never having had a bad experience, I’ve battled with some severe bouts of anxiety as a result of hearing of all these “horror stories”. There have been some exams where I haven’t been able to eat or sleep for 3 days prior and then at the exam, everything has gone smoothly and I’ve walked away with a 4 or 5 (B or A, respectively) (despite having been 100% sure that I was going to fail and that I would be completely humiliated by the teacher). After struggling with this self-induced anxiety for so long, I’ve had to adopt the following attitude: I can only judge situations based on my personal experience. One person’s experience with a certain examiner or exam is not my own and I should never accept it as such. My boyfriend had a bit of a rough time with one of the professors in anatomy during the last semester of our second year. In a midterm exam, he had been unable to answer a series of questions and the professor told him, “You’d better hope you don’t get me on the final exam.”. When the final exam rolled around (this exam consists of 3 parts, each with a different professor), he ended up getting this same professor for the first part. The professor remembered him and proceeded to ask him the exact same questions he’d been unable to answer at the midterm. He passed him, even though he was still unable to answer those questions to the professors satisfaction. Most of these controversial events take place during the first two years. From 3rd year, it is a completely different world. I’d been told that we would feel differently, but I really didn’t expect just how different it would be. The professors treat us like colleagues – and even refer to us as such – and when people fail an exam, it is usually quite graceful. I’ve witnessed two people fail oral exams and both times the examiners have said, “You did okay on these topics, but this is a very important concept and if you don’t know it at the final exam, then it will be a very big problem. Therefore, I must ask that you return next week.”. I think they do a lot to push you in the first two years. Maybe some teachers are just mean spirited…but I like to believe that in the end, they want us to be good doctors and they believe that to be good doctors, we need to be tough. – Many exams are conducted orally, but it depends on the topic. For example, during the first year: all anatomy exams are oral, the biophysics midterms are written and the semi-final/final have a written and an oral portion, and the chemistry and biochemistry exams are written. As we move into clinical years, the percentage of oral exams is increasing. It also varies depending on the department of a given subject. For example, there are two pathology departments. In mine, we have no midterms and the semi-final and final are both oral. In the other pathology department, they have written midterms and semi-final and half of the final exam is oral. – In regards to making a single mistake and having to do an entire year over again, there is no way that could happen. We are given 3 chances at each exam – with a possible 4th try with permission from the dean – and we cannot have the same examiner more than once. Exam period lasts for 6 weeks at the end of each semester. As long as you pass your exams and finish them on time, you move on to the next one. In order for someone to have to repeat the year, they have to either fail the exam 3 times, with 3 different examiners if oral, or run out of time during the exam period. – Lastly, I have not witnessed or heard of anyone I know being involved with anything regarding corruption (paying for grades/placement, etc). I’ve heard rumors, like with any school, of some rich someone buying some teacher something, but there has never been any foundation to them. When it comes to clinical experience, I can’t imagine that would even be necessary. Our internal medicine “professor” (the doctor we shadow every week) is very motivating and helpful and many doctors have told us we can visit the hospital to shadow them any time we want. I hope I was able to give you a little more insight into this issue. The length of my reply correlates with how much I want to represent the “other side”. All in all, I am very happy with my education here. A lot is demanded of us and that makes me very confident in my knowledge. In addition to the workload, I’ve developed a lot from the challenge of attending medical school in a foreign country. Having to push through these first years and overcome these obstacles (including speaking with the patients in Hungarian) makes me feel like I can handle anything. In fact, I welcome the challenges that await me after graduation with open arms. My main concern is that my son doesn’t fall foul of the system as I know he is a hard worker and will do what is reuiqred academically but if some professors don’t get on with him then I wouldn’t want him to fail his topics on that account. I managed to locate another current student at SE on the Linkedin portal and this person was very negative about the whole experience and yet was in the third year – so that made me very anxious and worried whether it is the best step to take for my son. I totally understand the worries that arise when looking at studying in a foreign country. There are so many things to consider and I think it is beneficial to tackle as many of these worries beforehand. When we first were looking at applying to Semmelweis, I also read a lot of negative comments on various forums. Luckily, I stumbled across a blog by a Norwegian girl studying at Semmelweis and was able to get a different perspective. I wish I could answer more to these comments, but to be honest, I have neither first-hand nor second-hand information about them. As for falling foul of the system, I really believe that a student will do fine as long as they know the material. I don’t know of any cases where someone failed an exam when they really, really didn’t deserve to. Of course, the reason for failing varies, but as long as a student is prepared, that is what counts. I’m sorry to hear that someone in my year is so negative about their experience here. But I also understand it. There are so many different opinions/cultures/personality types that factor into it. In the end, I am happy with my education here. It’s definitely not easy, but I like that. Midterms: take place in front of your group (you are with the same group for the first two years, anywhere from 10-19 students) there are often two or three examiners and the room is small enough that everyone can witness your exam first-hand. Semi-finals: you are taken in groups of 3 or 4 (sometimes more) to the teacher’s office. If the office is not big enough, one or two may wait outside. There are usually 2 or 3 in a room at a time. When the second to last is done, they have to stay until the last is finished, so that the teacher is never alone with the student. In my neuro semi-final, the teacher even kept my notes to submit the to English Secretariat in case there was any doubt surrounding my grade. Final: takes place in the lecture hall. There are somewhere between 10-20 students and 3-5 examiners. You are examined by 3 examiners during the exam. Everyone can witness everything. Semi-final/Final: first part is a written portion, if you pass, you go on to the oral. You are in a small classroom (with room for maybe 25-30 students total). There are usually two or three examiners and up to 10 students. Exams are conducted simultaneously, usually one at the front of the class and one in the back. Semi-final/Final: you are examined by two examiners in a room of maybe 5 or so students. Other students are preparing their topics while your exam is being conducted. Semi-final/Final: you have one examiner (for the final, there will be more, since we have more parts to the exam) and each examiner examines up to 5 students. I was the last one to be examined at my semi-final, and this was the only time that I was ever left completely alone with an examiner during an exam. His office was adjacent to his lab, however, so the lab technicians were nearby. I agree that there should always be another person present – a witness of sorts. And that there is. I think they do it to protect themselves as well as the students. In regards to pastoral support, this is where I think the university may fall short. There are some teachers that really engage on that level, but in general, they do not. Students here have to be pretty self-sufficient in that regard. I’ve had good relationships with some of my teachers and almost non-existent with others. As for lecturers, many of them are researchers and that can make them quite dry when it comes to the art of teaching. They do always stay after lecture to answer any questions. I honestly think the support is found among the students, especially older students. We look out for each other. The Latin class is silly, to be completely honest. The only benefit was maybe understanding some of the nomenclature in anatomy (we learn English terminology in anatomy, but there are some names that remain in Latin). I’ve heard that the head of the department is more strict with her class. Our teacher was very relaxed. We had two midterms for which we needed to learn 300 words with associated genders. That was it. There are several options to continue with the 6th year in other countries. I don’t know too many details yet, but I’ve heard that it is possible in New York and Las Vegas. I have a friend in 5th year who said that many people do their various rotations in different countries. As long as you are here for the exams, I don’t think it matters. I can ask my friend for more details if you would like that. Since I started Semmelweis a bit older (25) I had a lot less adjusting to do than many of the other students here. I remember a lot of people complaining that they had to do their own laundry and that learning to cook was too difficult. Then there was the matter of learning to pay bills, balance newfound freedom with the heavy workload, etc. Another issue that came up was the difficulty of living in a different country with a completely different culture, language, government, history – you name it! These were things I didn’t struggle with because I learned the growing up stuff early (I moved to LA alone when I was 18) and the cultural clash I dealt with when I moved to Norway in 2009. It’s a bit difficult for me to formulate exactly what I feel, so I am just going to write freely and hope that I end up with something coherent enough to communicate my thoughts. You have to prepare for everything to be different – and I mean everything. Every daily task will bring with it some new challenge and in the beginning, this will make you feel like it is going to be impossible. We went from paying all our bills seamlessly online to having to go to the post-office to pay – to wait in line, find out you are in the wrong line, get in a new line, but this one is only for stamps, so you need to switch to yet another line, etc. Things will not be like they are at home, not at all. But there is a beauty in that. If you can let it all go, allow yourself to just accept that things are different and embrace the challenges, you will find that things are better that way. As for the school, it can be challenging to get in, but the real challenge is staying in. We started as almost 300 students in my year and I think we are down to about 170 now, probably even less (it’s hard to tell with all the retakers and all the people who are taking some classes but will be repeating next year). I think we lost 50 people just this past exam period. Many people think that they are purposely trying to cut people out because they want to make money (you will hear this a lot!) but I’m not one of the people who believe that. I think it’s because it is a tough degree and not everyone is cut out for it, as harsh as that may sound. The workload is insane. You will rarely have time for anything other than studying. Some few people are able to manage partying every weekend, but many of them are now looking at having to retake a year. The first two years are supposedly the hardest, though I’ve heard the third year isn’t a walk in the park either. When we started, we knew we had to put on our fighting gloves and get ready to bust through at least the first two years. So far, it’s been working – but trust me, there have been some really, really tough battles and tons of blood, sweat and tears. Exam period is the worst. It makes you physically sick, mentally incompetent and psychologically broken. It makes you want to move to a tiny island and never do anything challenging again for the rest of your life. Getting through exam period? The. best. feeling. in. the. entire. world. I love living in Budapest, but that is not to say that it hasn’t been challenging. In the beginning, there are so many new people and everything feels so difficult – even going to the grocery store can be hard! I knew a few people who were around your age when they started and found it difficult to adjust to life on their own in a new city (roommates, chores, language, money, freedom, etc). In addition to the challenge of living on one’s own and in a foreign country, is the curriculum itself. I don’t know too much about the pharmacy program, but I imagine that it is equally as hard as the medical one, if not more. The program is quite small, I think sometimes even under 10 people, but I could be wrong. There is also a dentistry program with maybe 60-70 students. Medicine is the most, usually around 250 first admitted (we’re down to around 150 now). For the first two years, I wasn’t very good at getting out and exploring the city. I spent most of my time inside studying. This year though, I’ve really enjoyed the life we have there! You get to study with people from all over the world – the international community here is huge. I think the city is absolutely beautiful and there is such a special feeling about it. It feels casual and judgement free. One of my favorite things to do is grab a bottle of wine with a friend and sit along the banks of the Danube talking into the night. There are plenty of amazing restaurants and wine bars, clubs, museums and libraries. The public transportation is cheap and efficient. 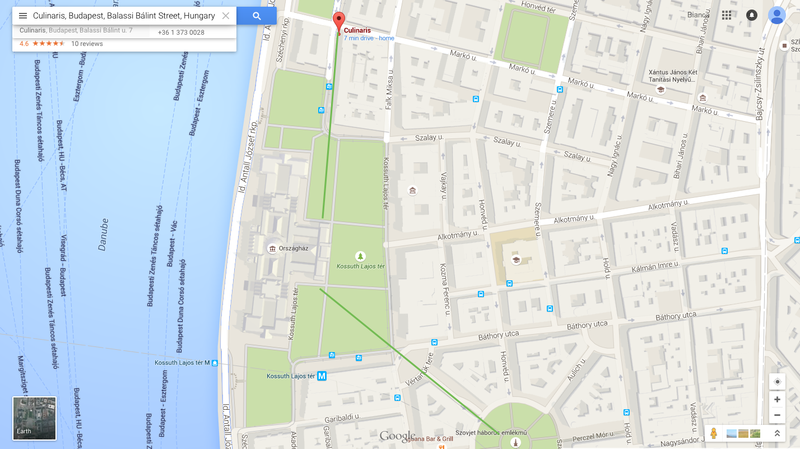 Margit island is perfect for running, walking, biking, swimming, picnicking – you name it! The time I’m spending in Budapest feels so special to me and I’m so acutely aware of how short the time really is. You get used to the language and the people and eventually feel like you’re part of the city, a city that you may never have visited otherwise. I wouldn’t change my decision to study in Budapest for anything. For me, it has really been an experience of a lifetime and I feel really lucky. But Budapest isn’t for everyone. Some people hate it from the beginning and leave right away, some of them stay and continue to be miserable. Those that are happy here are the ones who choose to simply enjoy it and not constantly compare it to their home country. It is what you make it. I love studying in Budapest. It is such a beautiful city and I feel so lucky to get to be here for this chapter in my life. The buildings are stunning and the weather is amazing. I love being able to get around so easily and there is so much to do and see. We are soooo spoiled living here as students. There are definitely some small struggles (mainly with the language). Sometimes I feel a little lost here, it’s not easy to dive right into the culture when you can’t communicate with people but it is getting better with time. There is a huge international community here, our student body includes people from literally all over the world. We chose to study here after applying to schools via a university in Norway. Going to school there wasn’t an option for us for several reasons and this school helps with applying to schools in Slovakia, Czech Republic and Hungary. After looking at all the schools, we decided that we liked Semmelweis the best. If you’re interested in studying abroad, I recommend it 100%. There is no greater experience than living in another country as a student. I have had so many amazing experiences that I would have probably never had if I had stayed in Los Angeles. You learn so much about yourself and the world….it’s just amazing. Don’t let what people say get you down or make you try less, they don’t really know what Oxford wants ;). You never know what could happen! I think I wrote somewhere in one of my blogs about how the first person I told about me moving to Norway responded by saying it was a horrible idea and that if I did that, I would never become a doctor. It’s a good thing I didn’t listen! Seriously, throwing yourself out into the world is the most invigorating and rewarding experience you can have (at least speaking from the experiences I’ve had in my lifetime). That’s a good question. I deal a lot with the concept of “home”. I have no childhood home in the states (my mom recently moved to Minnesota, where I’ve never been before) and when we visit Norway, we stay with Skjalg’s family. So that leaves Budapest as my “home”. I’ve gotten comfortable here and it is nice to study with so many people from different countries, but I feel really, really limited by the language. Hungarian is so hard to learn and even more so when studying medicine on top of it. I usually tell people that home is a bit of a diffuse concept for me right now. Home is myself and Skjalg for now. I may not be the best person to ask about time spent studying because I study pretty much all the time. There are many people that are able to get away with cramming at the last minute, but honestly, it gets to a point where it creeps up on you. The curriculum here is extremely heavy and they demand a lot of knowledge from us. I can’t speak for medical schools in the states, but there were some medical students visiting here this past month from Buffalo and they told us that our education seemed much more demanding. That is also something we’ve heard from people attending medical school all over Europe.If you want numbers, in regards to time spent studying, I can give you some from my second year (last year). During that time, I logged all my hours into an app called TimeSheet. Studying during the semester varies from maybe 4 to 9 hours a day (depending on classes that day of course). During exam period, it ranges from 9 to 15 (sometimes up to 17/18) per day. So that is about 67 hours a week (though, a huge chunk of those hours are during exam period). When it comes to studying, there are a few things that have saved me. The first: color! I have 5 different colored pens and 5 highlighter colors PLUS colored pencils that I use when I take notes. I know it may seem silly, but it seriously works. It keeps me more engaged, more aware of key words (since those should be in a different color, of course) and makes note-taking fun. It’s also more interesting to read notes when they are visually appealing. The second is drawings/diagrams. I’m visual learner and I find that drawing out complex ideas really helps me understand them. When we study, we even use this giant white board to communicate our ideas to each other. The third is change. I think it is so important to not get stuck in one specific way of studying. There is a lot of trial and error and you can’t get too attached to a certain way of doing things. This semester is maybe the first (in these two years) where I really feel like I have a good technique for all of my classes. No two classes are the same! For physio, I print the lecture slides and have them spiral bound. Then I take notes on them during lecture, plus add in more when listening to the lecture for a second time at home. Anatomy is all drawings and testing each other. Lots of lists and memorization. For biochem, I use the lecture slides but make my own notes from scratch (so I rewrite material on the slides and copy down some of the drawings). Since we have so much to study, we can’t afford to lose time to procrastination. If I’m struggling with getting something done, I will usually switch it up. I’ll switch to another topic or switch to another way of doing it. For example, watching a youtube video on the topic or just doing a google search and seeing what people have to say about it. I’ve also tried taking 10 minute breaks every hour, or going for a short walk around the block. Honestly, anything to clear my head and start fresh. In the beginning it was really hard to get motivated. Now? I can sit and study for 14/15 hours with only some bathroom breaks and quick breaks to make lunch/dinner. We have a 2 bed, 2 bath apartment in the center of the city where we pay around 600 euro a month for rent and utilities. This is really quite cheap for the size of the apartment (which is also furnished) and the location. I know some people are able to find even cheaper apartments a little bit out of the center, but they may not be as nice. Sharing with a roommate seems like the way to go and I think most people spend around 200-300 euro a month. I highly recommend seeing the apartment for yourself before signing any kind of contract! We rent through a company called VIP Properties. I think we set up an appointment through the school in the very beginning to go around the city and look at apartments and then we ended up staying with VIP when looking for our second. We are really, really happy with them. The respond almost immediately should we need anything. For example, on a windy day, one of our windows slammed shut and the glass blew out onto the street. They were there a couple days after with a new window and replaced everything without any cost to us. They have fixed anything we need without being difficult. Food here is quite cheap. A run to the store for essentials usually runs about $20. We get our student loans twice a year, once before each semester. After the school payment, we are left with about $6,500 for the semester to cover rent, food, school supplies etc. In general, eating out and studying at cafés is very affordable for students. Did you end up finding your apartment online? I read from your posts that your boyfriend went to Budapest in advance to go apartment hunting. I’ve never been to Budapest before so this seems like an immense task. I also wanted to ask you whether you could tell me where most of the 1st year classes are held. I want to find an apartment that is somewhat close, mainly so that i’m not dependent on public transit. 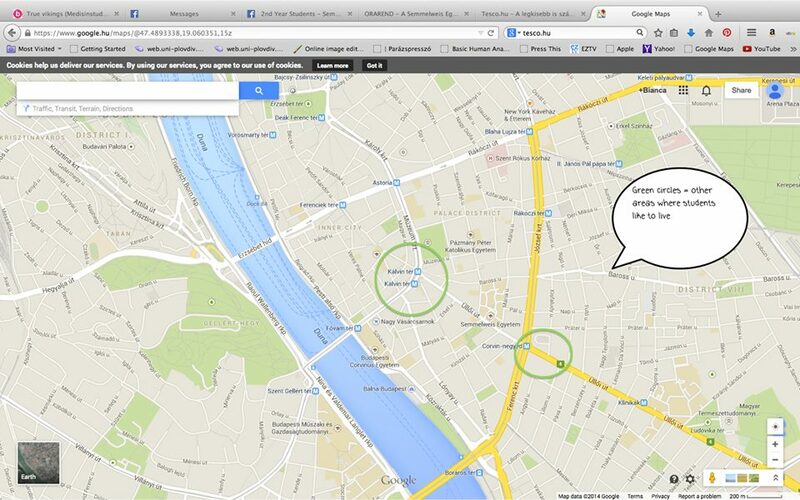 We ended up finding our apartment on that visit that Skjalg took to Budapest. It is an immense task for sure, but I really believe it is worth it. If you are looking for your own apartment through the various companies online, it is not always guaranteed that the apartment will look the same as it does in the pictures, or that it is even the same apartment at all! There were several times we went to look at an apartment and it ended up being rented out and they would try to show us other apartments they had which were not as nice. If you find a room/roommate in one of the Semmelweis groups on Facebook, this is a bit safer. My best advice though is to see the apartment before you agree to rent it/sign a contract – in any case. Usually people come down a little bit early, maybe a week or so, and go on a sort of tour of available apartments around the city. People are usually able to find one within a couple of days, especially if at the end of August. The only downside about coming at the end of August is that a lot of the really nice ones or ones with good deals are already taken in the beginning of the month. During first year, the majority of your classes will be at the Basic Medical Science building at Klinikak in the 8th district. I do not recommend living here though! If you want to live within walking distance to school, then you should check out the area around Corvin Negyed. They have a lot of nice apartments around there and it is within 10-15 walk. Corvin Plaza is a decent sized mall located there and there are a lot of really nice, new apartments in that area. 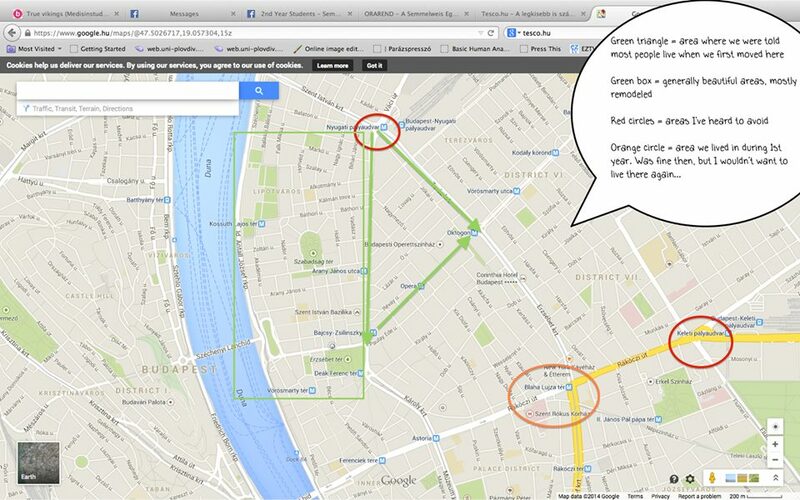 I’ve attached a map that I sent to another blog reader about my tips about where to live. I would not recommend living in the area immediately around school. It’s not the nicest area and I’ve heard rumors about there being a lot of break-ins. 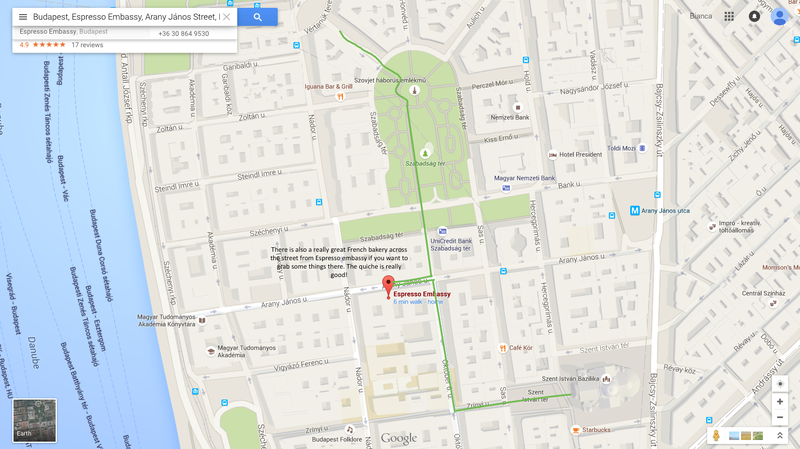 If you want to live within walking distance, I recommend checking out the area around Corvin Negyed. Regarding finances, this was a big reason why I moved to Norway. I was having such a hard time getting scholarships/aid in the states and going to medical school there would have ultimately been impossible (since I am paying for it myself). Once I passed the university level Norwegian exam, I qualified for aid in Norway and they have since funded my entire education here. About 30% of the total (I think – honestly not sure) will be converted to aid and the rest I will have to pay off once I am done with school. I have loans in Norway, which I need to apply for each school year. At the end, I’ll probably have around 112,000 euro in debt. We don’t have to pay it all back, some of it gets converted to a grant, but I will have to pay back at least 60-70%. I know it’s a lot, but for me that was the only way (I’m also paying for it myself) . As far as I know, Semmelweis doesn’t have a financial aid system. You get a $300 reduction from your tuition if you get a position as a teaching assistant. In Norway, we have the option to work here during 6th year, so I am planning on doing that so that I can make some money. Otherwise, I will just have to pay off the loan as I work. You can choose where you would like to do it. I did my nursing practice (which must be done before 3rd year) in Budapest and it was ok. I was in the pediatric hospital at Corvin and we didn’t really get to do very much. My friend Rina was in the cardiology department over on the Buda side and her experience was great, so I think it really depends on the department you end up at. My friend Amir is doing his internal medicine practice (which we do between 3rd and 4th) in Budapest now and so far he is loving it. His doctor is very hands on and takes time to explain things, ask him questions and challenge him. We are also a lot more “exciting” as med students after 3rd year. I’ll be doing mine in Bodø, Norway where my boyfriend is from. In 6th year, you have to do rotations in several departments, for 1.5 months at a time, and I’ve heard of some people doing some of them in Norway, some in the US, some in Spain, some in Budapest, etc. You have to do summer internships, so you won’t really have entire summers off. The first internship is a nursing practice and must be completed before 3rd year. Then it is internal medicine practice and surgery practice (after that I don’t know). For the nursing practice, you can work pretty much anywhere. If it is in Norway, then you could just try messaging the secretariat and letting them know and they will probably just add it to the list. Otherwise, there is a form you can fill out to get your location approved (a lot of people do it, so this shouldn’t be a problem). I’m so happy to hear that you have heard such good things about Semmelweis! I definitely feel like the education I am getting here is amazing – challenging, but amazing. To be honest, I’m not so sure how the transferring process works here. I know that they accept transfer students after the second year, because the first two years have overlapping classes. This year, we got new students from two other universities in Hungary. It’s probably going to be a bit hard to find good info online. You can try contacting the English Secretariat, though they aren’t always the easiest to communicate with (one of the downsides here). Otherwise, there is an official student organization that is usually pretty good at dealing with all sorts of student affairs and there may be someone there who knows more about this than me.